Starting from the traditional representation of the Tree of Life I have explored some possibilities of looking at it in a wider perspective, in a more symmetrical form. Nature likes symmetry, from an apple or flower to the quantum world of sub-atomic particles. I have always wondered why the Kabalistic tree of Life was such a strange structure. At certain places in the tree it displayed symmetry, but then this symmetry was broken at other places. It is claimed that there are only ten Sephiroth because somebody in the distant past wrote this in his book. The tradition of enumerating 10 Sephiroth is stated in the Sefer Yetzirah, “Ten Sephiroth of nothingness, ten and not nine, ten and not eleven”. But where did the writer get this from? The problem with written teachings is that they easily turn into dogmas. For this reason certain traditions would pass their knowledge on solely in an oral way. The knowledge had to be experienced, and not just accepted because somebody told them so. What I see in Kabala is that some people take the information as an unmovable, and unchangeable truth. In my previous articles I have shown that one can change the Tree of Life in a more coherent, symmetrical form, and still keep the traditional teachings. It was once thought that there were only seven planets (moon and sun included). If science had stuck to that idea, because at one time somebody wrote that there were only seven planets, not one more, nor one less; we would have never discovered the outer planets. Why did the people who originally wrote down the structure and information of the Tree of Life, structure it in such a unique form? Throughout history the Tree of Life has been interpreted in different ways, for example, by taking out or in Kether and Daath. However they kept it in its basic structure; although there was one representation (by Isaac Luria (1534 – July 25, 1572)) that depicts the Sephiroth metaphorically as successively smaller concentric circles, radiating inwards from the surrounding Divine Omnipresence. Concentric representations of for example different worlds are common among religious or esoteric groups. 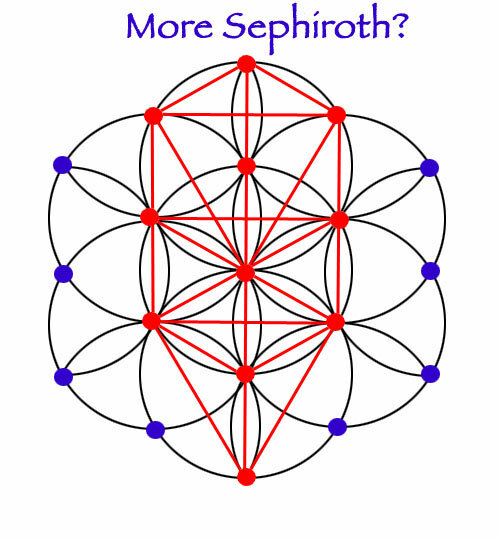 In my previous articles I have shown that I discovered that the Sephiroth have their place on the intersection of four symmetrically interlocking circles; only to find out later that others had discovered this as well. So it’s nothing new. The intriguing part is the symmetry of interlocking circles and the possibility of two more Sephiroth just above Malkuth. But it gets even more interesting. 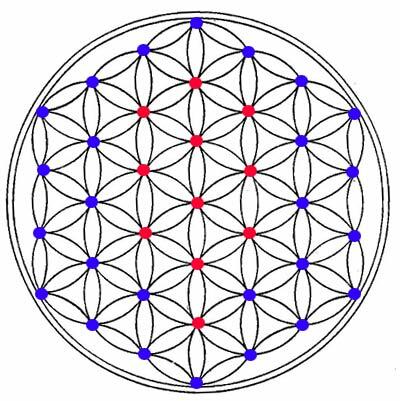 In my article of The Structure of the Tree of Life I have shown that this pattern of the four interlocking circles is part of the Flower of Life. There had been a lot of interest in The Flower of Life pattern, as it is being discovered in traditions and ancient cultures all over the world. 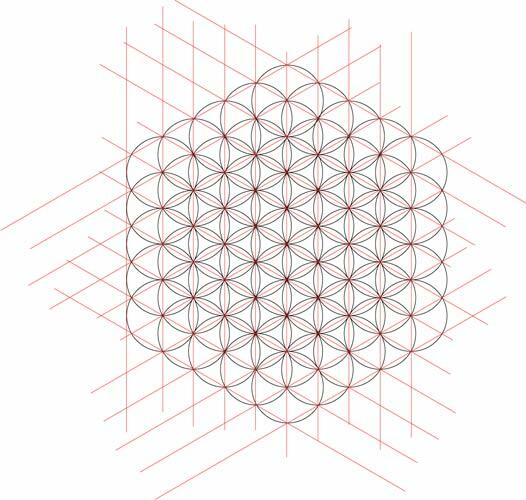 The Flower of Life is a basic energy grid that can be seen as interlocking circles within one circle, or as a hexagonal grid of straight lines. I think the Tree of Life is a part of an energy structure, that is commonly known as the Flower of Life, but which can also be extended into infinity. 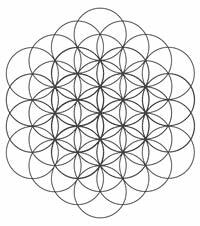 Let’s first go into what the Flower of Life is. 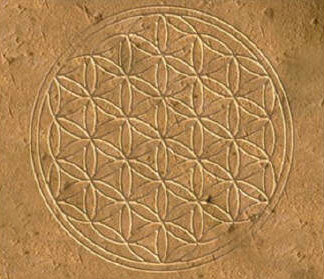 Here is an example of the Flower of Life engraved into a temple wall in Egypt. Even Leonardo Da Vinci was acquainted with the Flower of Life, which shows up in his drawings. You can find more photos from different locations around the world here. What is it about this form that was so intriguing to the ancient mystery schools, religions, and esoteric orders, and that is presently gaining again so much interest? The answer to question is that the flower of life pattern is a pattern of an energy structure that lies at the basis of nature, and all life forms. It is life energy structured as a geometric web, in a dimensional form as a hexagonal line structure, or interlocking circles providing points of contact that lie on these lines at regular intervals. 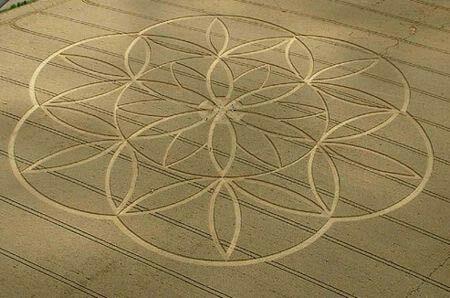 Energy is wave form, and one might see the ‘petals’ of the Flower of Life as undulating waves. But energy wave forms are always three-dimensional, and thus what is shown as interlocking circles are in fact interlocking spheres. Visualizing this in 3D gets a little too complicated for our brains. Isn’t it interesting that some people have claimed (and drawn) that the Tree of Life might have a three-dimensional form too? In regards to the spheres, a little comment: the level of subtle energy we are dealing with here is sometimes called etheric or ethereal. It is a subtle energy form that although invisible to our eyes, is nevertheless real, and can be perceived by those with psychic gifts. But it is now also being (re-)discovered by some scientists with interests into the old ether theories, and by those who talk about the so-called longitudinal scalar waves, the science of which is claimed to have been developed in secret by the military. This is not the place to go into this science or technology. You can look it up on the web. 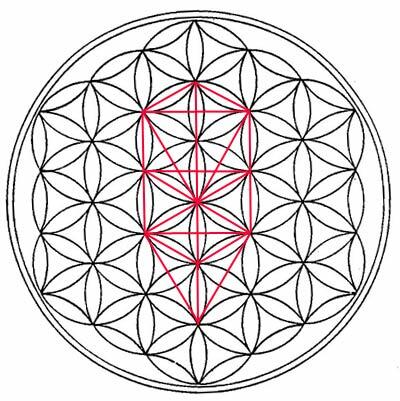 I am convinced that in esoteric circles where knowledge was transmitted by experience, the initiates were able to perceive the energy grid of the Flower of Life, and that the cabalists discovered, by actual visual experience, that part of it formed a Tree of Life in relation to the human body. For those who were not initiated, the Tree of Life just became book knowledge. 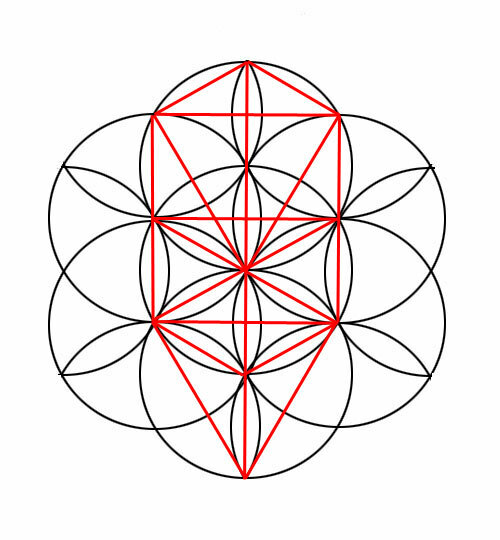 One could argue that all this is just a mathematical coincidence, but I found the connection between the Tree of Life as formed by interlocking circles and by extension on the hexagonal grid and the flower of Life as an energy grid for a living being. It was a dowser who found that the Tree of Life is an actual energy template that relates to the physical human body. Joey Korn, a dowser, has an informative website at http://www.dowsers.com . you can find the whole story there, but I’ll give you a summary. previously he had found, by using L-rods, that humans had two lines of energy (or rays of light, as he calls them) that intersect and form at that intersection a vortex of energy. This is not a new concept as this is well known by dowsers of energy lines in nature. But with humans he believes that they anchor the soul to the body. 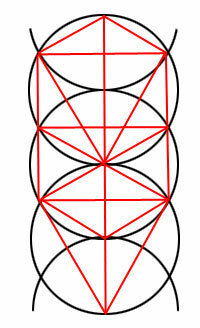 Looking into it a bit further, he found that these intersecting lines were repeating themselves in a pattern. They also existed in people’s bed, as an imprint of the person who sleeps in that bed. The energy of the ‘bed pattern’ always dosed positive. As he dowsed more he found that the lines always came in pairs like an X or a + form. In 1197 he came up with an initial pattern. He also found that with some people the ‘bed pattern’ wasn’t always that strong, and sometimes some of the lines were missing. This would reflect the health situation of the person. The initial pattern was the result of dowsing the energies that were contained to the physical size of the bed. Later he found more lines that existed beyond the boundaries of the bed, but that also were part of the now more complex pattern. I want to point out here that originally he was looking within the confines of the physical dimension of the bed, and therefore the other lines didn’t show up. It is well known that the drawback with dowsing is that one’s results will reflect one’s belief system about what one is dowsing. Having arrived at a certain pattern of the number of lines he had discovered so far, one day he picked up a book on Kabala and was surprised to find that the pattern he so far had found was the same as the Kabalistic Tree of Life minus a number of lines he had not dowsed yet. The next morning he dowsed again the ‘bed pattern’ and indeed he found the remaining pairs of energy lines. Now he had found the entire Tree of Life energy lines/pattern that is present in the energy field of every person, and by extension in their beds as an imprint. I contacted Joey because I found his article very interesting (and I urge you to read it here ).I also suggested to him that there might be more energy lines and Sephiroth in this human energy pattern, based on the geometrical pattern that I have been explaining in my previous articles. But unfortunately, he strictly believes in the statement in the Zohar that there are only ten Sephiroth, not one more, not one less. As I just mentioned, the drawback of dowsing is a dowser will not find what he believes does not exist. A pity, because otherwise he might have found that the Tree of life is part of the Flower of Life pattern. This leads me again to the possibility that the Tree of Life is only a part of the human energy pattern. In all likelihood, the entire human energy pattern is the Flower of Life as it was and is known in the mystery schools and esoteric teachings. This implies that the there are other Sephiroth or energy vortexes on the intersection of the other energy lines, outside the traditional representation of the Tree of Life. These also embody other human energies/qualities which are present in each person, but have not been paid attention to by the traditional kabalistic teachings. They might represent human psychic or spiritual qualities that are present within each one of us, but which we haven’t explored yet. As you can notice, there is a Sephira/vortex/energy center above Kether (≈ crown of the head) and below Malkuth (≈ feet). I want to bring to your attention that in recent years there have been people talking about an additional chakra above the head and one below the feet. We know so very little about the human energy system. As time goes by we will discover more about these energy centers. Also keep in mind that what you see on this page is a two-dimensional view, which represent one section of the energy grid. The entire system is a three-dimensional energy grid of interlocking sphere comprised within one big sphere. Thus there are many more intersection points/vortexes.